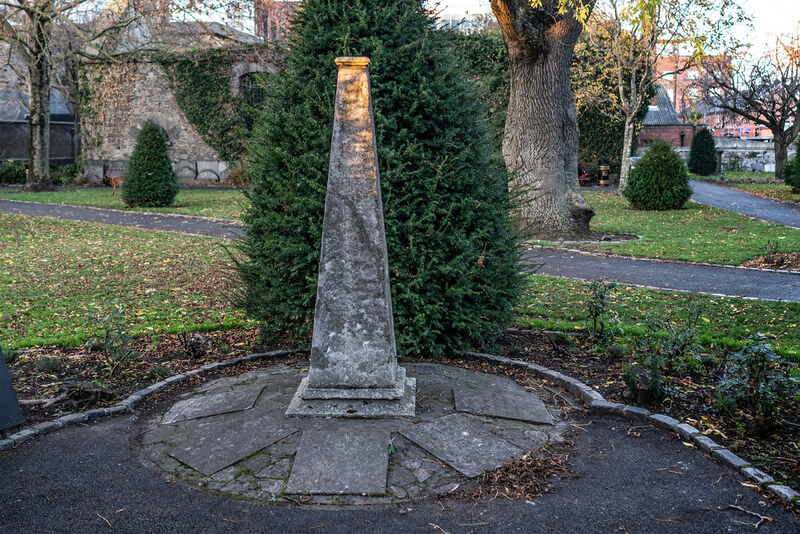 Next door to Kevin Street College there is a little public park consisting of St. Kevin's Church and Churchyard. I studied electronics and telecommunications for five years at Kevin Street college which is next door and I was totally unaware of the existence St. Kevin’s church until a few years ago. It is more than likely that it was not open to to the public until after I completed my studies. 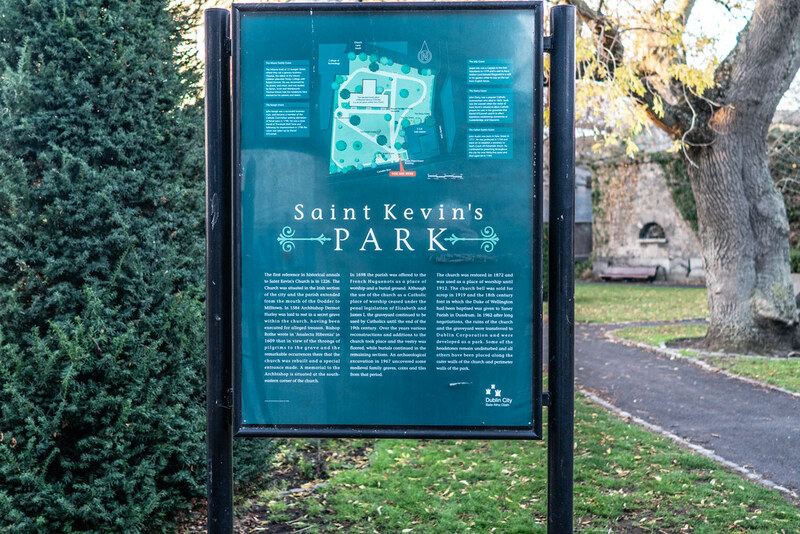 St. Kevin's park is according to locals both haunted and cursed. 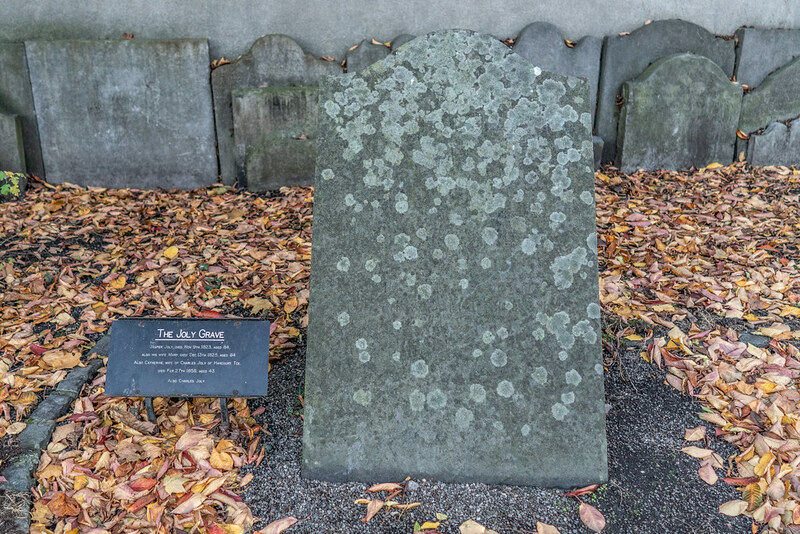 I do not know if it is haunted by the people who had their gravestones moved, by the souls of the unclaimed victims of the great famine or the spirit of Archbishop Dermot O'Hurley who was horribly tortured before his death. 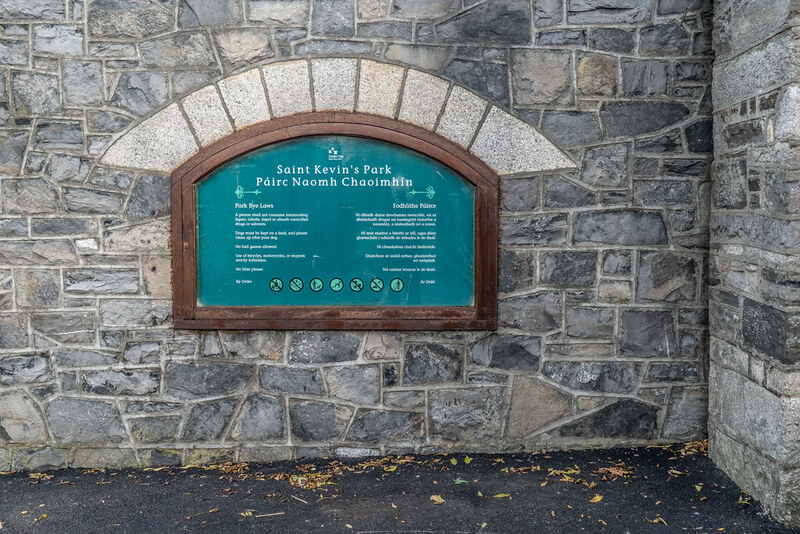 In 2018 it is a strange place to visit because it is popular with dog owners and homeless people but at the same time the majority of Dubliners are unaware that it exists so few visit it. I have made a number of attempts to fully photograph this churchyard but usually I have to limit my activities because of the number of homeless people sleeping on benches and because I do not want to intrude on their privacy. In general they are friendly and keen to express their views on life in general but sometimes that are people who have had too much to drink and they can be difficult to deal with. Today, my camera attracted unwelcome attention so I had to move on. 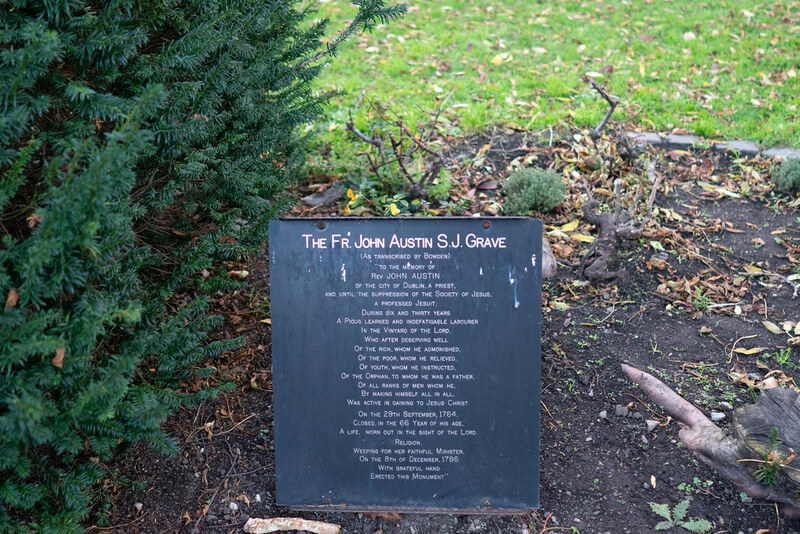 Rev John Austin S.J. 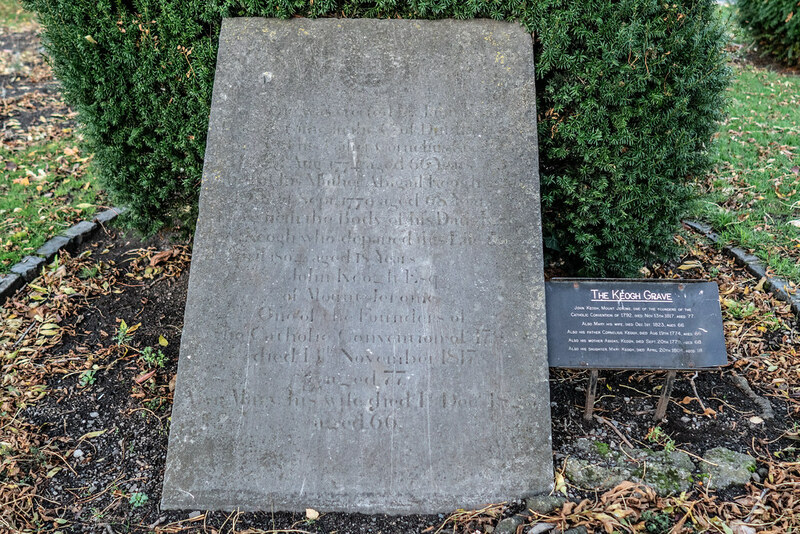 (1717–1784), a pioneer of Catholic education in Ireland, whose tomb was restored by Rev. Dr. John T. Laphen, of St. Catherines, Meath St.
Jean Jasper Joly (1740–9 November 1823), captain of the Irish Volunteers in 1798. John Keogh (1740–1817), intimate friend of Theobald Wolfe Tone, who once owned the land where Mount Jerome Cemetery now stands. 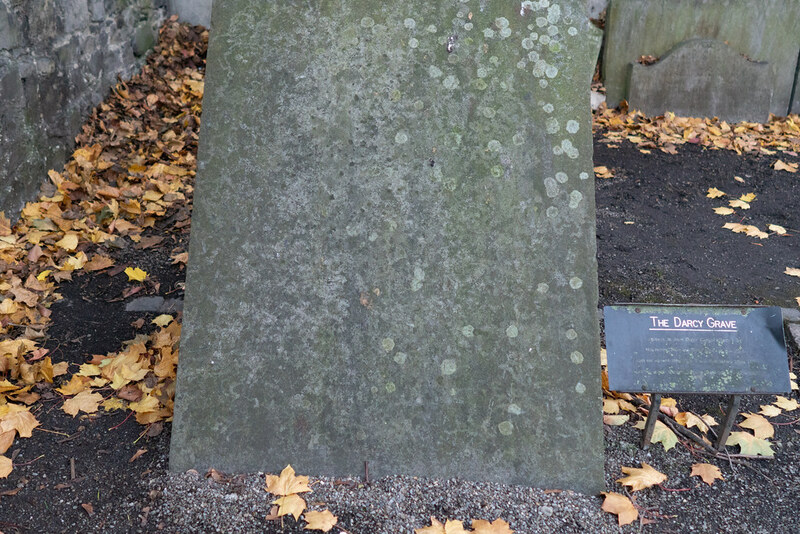 Hugh Leeson, brewer, whose gravestone lies against the south wall of the church and whose family gave its name to Leeson Street and became Earls of Milltown and owners of Russborough House, county Wicklow. The Moore Family (of Thomas Moore). 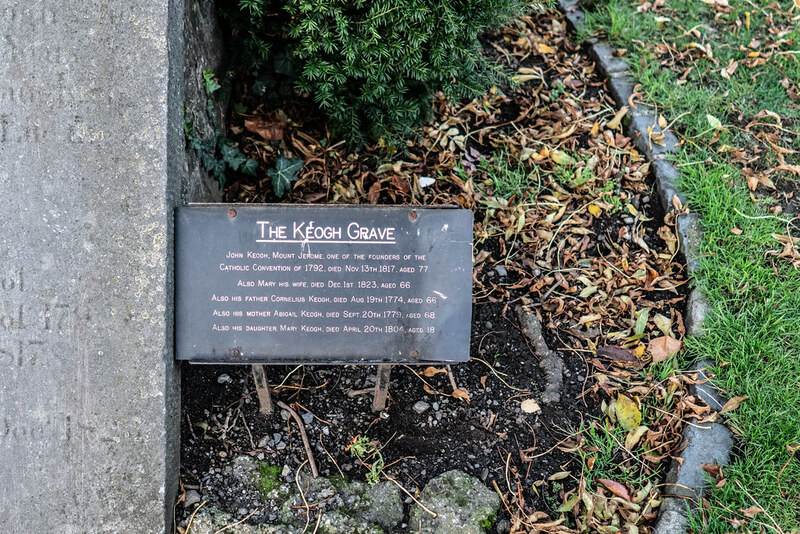 In 1825 John D'Arcy, owner of Anchor Breweries, the second largest porter company in Dublin at the time, was to be buried in St. Kevin's cemetery, having died suddenly after falling from his horse. 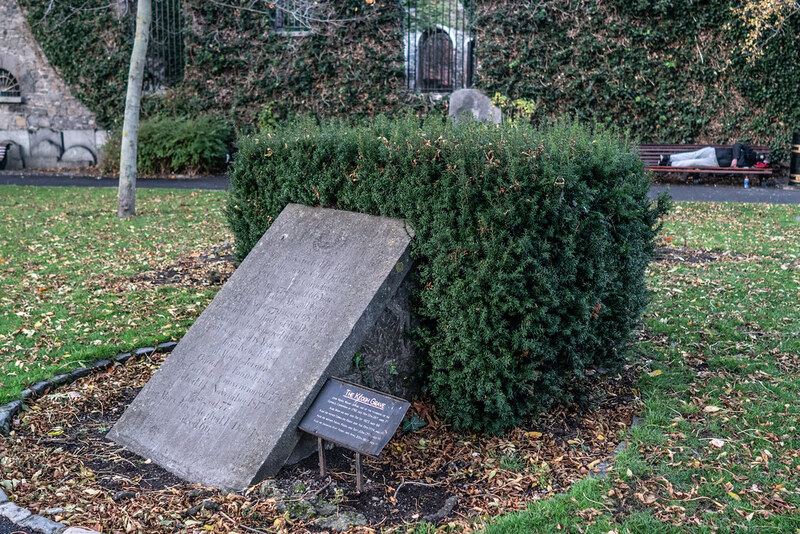 When his funeral procession from Francis St. reached St. Kevin's cemetery the sexton, under the authority of the Protestant Archbishop of Dublin, Dr. Magee, met it at the gate and forbade Catholic prayers being recited at the grave-side; they had to be said on the roadway. The mourners retreated peacefully, but a huge outcry erupted as soon as the facts became known, which reached the ears of the Lord Lieutenant, The Marquess Wellesley (brother of the Duke of Wellington, and himself married to a Catholic). 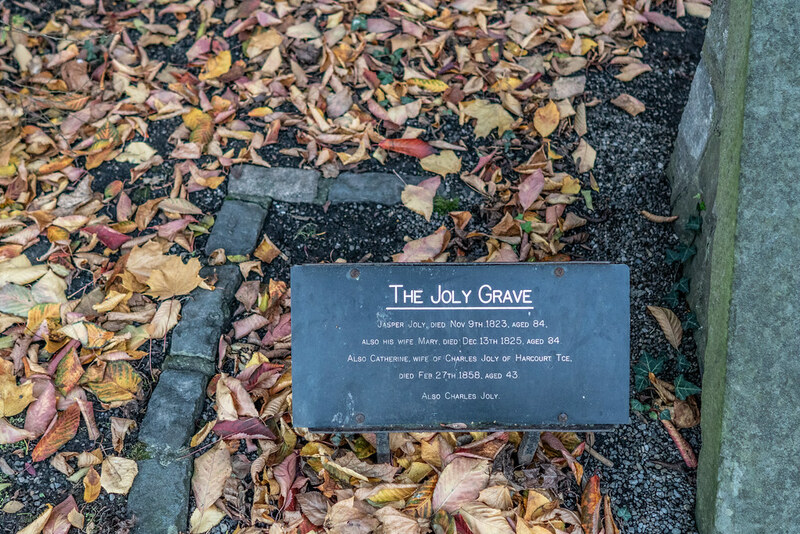 He expressed disapproval of Dr. Magee's order, and despite much opposition (cemeteries were a valuable source of income to their owners) tried to alleviate Catholic grievances. Daniel O'Connell used the scandal provoked by this to such effect that he was able to get through the legislation in establishing Golden Bridge (1829) and Prospect (1831) cemeteries, which led to the establishment of Glasnevin Cemetery. 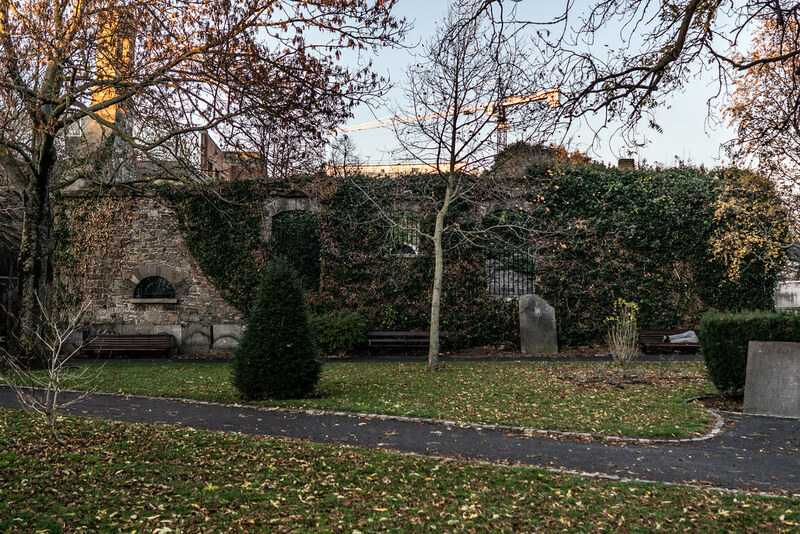 At the start of the 19th century the cemetery, like many others in Dublin, became a target of the body-snatchers, although it was surrounded by high walls (changed to railings in the 1960s). In February 1830 a Frenchman named Nagles and his friend were attacked by a group of "sack-em-ups" lying in wait near the cemetery. The criminals' attention was diverted by the arrival of a cart-load of dead bodies, giving Nagles the opportunity to escape and notify the police at Arran Quay, who apprehended the culprits. [ On one occasion a body-snatcher was chased as far as Thomas Street, where he finally dropped his booty—the body of a young girl. In June 1961 the body of a local five-year-old boy Tommy Powell from Cuffe Street was found in the graveyard. 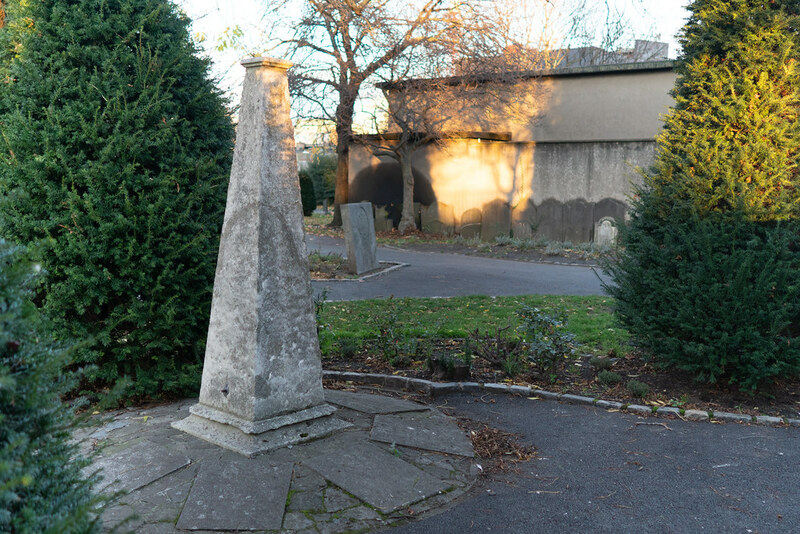 Blood-stained stones found nearby indicated that he had been murdered, but despite an intensive investigation, the murderer was never discovered.